Here at QBI, our building inspections are conducted by licensed, professional inspectors and is done in accordance with the Australian Building Code AS4349. This inspection consists of a visual assessment of all accessible areas on a building to identify any building defects including urgent maintenance. The report is comprehensive, easy to read and includes detailed photos. It will prioritise any major building problems and maintenance issues found in a building. Performing construction stage inspections ensures completion to the required standard before you release scheduled payments agreed to in home building contracts. A dilapidation report is extremely comprehensive and is carried out on a building before work is done on a nearby structure. The report takes note of the condition of the building before the work is done, so that if any damage to the building occurs, the building owner can prove that it occurred as a result of the construction carried out. The building owner gets a copy of the report as well as the person doing construction nearby. This serves to avoid disputes about any damage that may occur from the nearby construction. Another report is undertaken once the works are completed to document changes to the building, if any. A dilapidation report would be suitable in these circumstances: a large hole is being dug on a neighbouring property, Water Board pipes are being laid, road works are being carried out, or a retaining wall is altered, and so forth. Creating a dilapidation report also protects you from claims made by neighbouring and adjoining properties during the demolition and construction process of your building project. Having a renovation report done is a vital step in the renovation of any building. Our inspectors will inform you on what is structurally safe and which parts of the building can’t be touched. The importance of Asbestos Inspections before commencing demolition or any building work cannot be over emphasised. Workcover requires that certain asbestos material only be removed by licensed asbestos removalists because of the risk of release of the asbestos fibres. Specialist expertise is required to identify the different types of materials, location and areas that can be removed by a builder. Our experts are able to complete a register of the area and condition of asbestos to reduce the risk of asbestos contamination. Why get a Building Maintenance Inspection Report? If building and property maintenance issues are identified and repaired early an owner can save thousands of dollars in some cases as major repairs can be prevented altogether. Our reports will identify any major building problems and maintenance issues that should be rectified to prevent further deterioration of a building or property. What sets us apart from the rest? These inspections are carried out by 2 highly qualified inspectors, specialising in their own fields. You will receive 2 Independent Reports – one detailing the Building Inspection findings and the other details the pest inspection. Your home is one of the biggest investments most of us will make in our lives – don’t let it all come crumbling down because of an invader that’s only a few millimetres tall! Termite inspections and a thorough building inspection conducted by professionals should be an essential part of your home’s ‘insurance’. 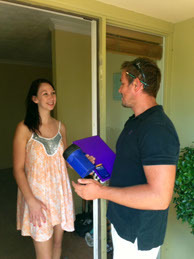 Queensland Building Inspections can provide expert advice and treatments that can protect your home. Skilled pest control technicians will follow Australian Standards recommended practices ensuring you’re receiving the correct termite or pest treatments and advice. Is It Normal To Expect Cracking To Occur In Brickwork, Walls and Ceilings?